Welcome to The Bungalow at Island Breeze - an ideal romantic hideaway for a peaceful island vacation. This is the best value in town for your dollar for a home on the beach. 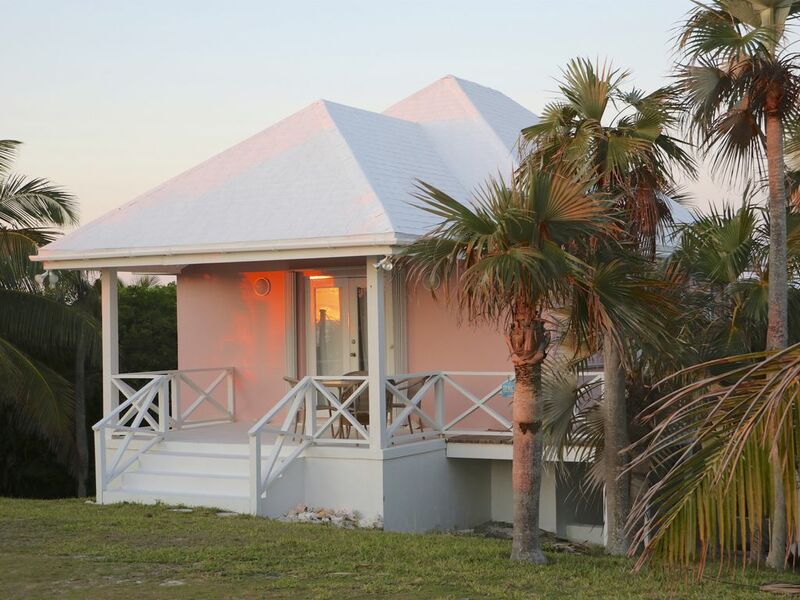 The Bungalow at Island Breeze is located on the Atlantic side of Eleuthera near the quaint settlement of North Palmetto Point. A sandy pathway from the cottage leads to a dune deck overlooking a private white and pink sand beach, making it a delightful spot for your morning coffee. Enjoy snorkeling and swimming in the calm turquoise waters teeming with coral reefs and vibrant tropical fish. Or explore the beach for an assortment of exotic shells, sea glass, and the elusive sea beans that float over from Africa and are rumored to bring good luck to their finder. The Bungalow has a full equipped kitchen, breakfast bar, living area and a queen size bed in an over-sized studio design. A fully equipped kitchen awaits you along with all the comforts you would expect in your own vacation home. The Bungalow is fully air-conditioned with ceiling fans, comfortable furniture, a full bathroom and an outside shower. The French doors facing the Atlantic ocean open out to a large covered deck with a sundeck located on the side of the house. The sundeck is perfect for outside dining and using the charcoal grill.Linens, bath and beach towels, beach chairs, shampoo and body wash are all provided. Our first visit to Eleuthera was in 1992. We fell in love with the breathtaking beauty and warm welcoming residents. We knew that Eleuthera was a very special untouched island, and we are excited to open our home to you. We wish you a visit that is filled with much love, laughter, and beautiful memories. From our family to yours – Welcome to Eleuthera! Warmly, Michael and Katy Broderick p.s. Be sure to…see a sunrise, see a sunset, see the stars at night, walk the beaches, explore, make new friends, read a good book, do absolutely nothing…return again to Eleuthera! Both bath and beach towel. Fully applianced with all the utensils you'll need! Outside dining as well as stools at the breakfast bar in the kitchen. Mixed reviews lovely view bungalow in need of upgrading friendly island for the most part. Stanton Cooper rentals recommended by Home Away could not give us directions to Island Breeze and we could not find the property. Despite giving property manager arrival time, We were not expected and had trouble entering the property. Average to poor accommodations. We were overwhelmed by no see ums The island is interesting but sites and beaches poorly marked. Most ATMs way too expensive. We would do things differently if we went back, such as bring lots of cash and make sure we know how to find and get into property, andvresearch car rentals ourselves. We had issues with Stanton Cooper car rentals despite being recommended by Home Away. I am very sorry to hear that you had difficulty during your trip to Island Breeze. The information Package that was sent to you when I confirmed your reservation contained detailed directions to Island Breeze as well as several maps of the island, one of which was a map showing the route from Governors Harbour to Island Breeze. Aside from the no-see-ums and ATM fees, both of which are out of our control, I am not sure what additional information would have been of assistance to you. The owners, our property manager and I take great pride in passing along as much information as possible to insure that our guests arrival and stay at Island Breeze are as memorable and enjoyable as possible. I am giving 5 stars for what this is. Meaning, not a 5-star hotel, but it is 5 stars for what we wanted-a clean, nice place with oceanfront views that can't be beat! There are snorkels and comfy beach chairs. We had coffee on the front porch every day. When the road turns to sand (unpaved) it can be a bit rutty and branches scratched our rental until we learned how to avoid them :-). (I recommend an SUV, which we ordered, but our rental car company had to switch at the last minute to a sedan). In terms of supplies, there is soap, shampoo, dish soap, salt and pepper, and cinnamon. If you want any other spices, bring them or purchase them. Also stocked with paper towel, toilet paper, zip-lock bags plastic wrap, and coffee filters, which was great. I recommend packing snacks like crackers and nuts for any of the out islands, as well as small jars of peanut butter, mustard and mayo, and coffee, because that stuff is expensive here. That's what we did. We've been to Exuma and learned our lesson. I recommend some good insect spray for the mosquitos and no-see-ums. But, all in all those only were out in the morning and evening. Also, you will need to buy drinking water in a jug or bottle in town, but everyone in the grocery store seemed to be doing that, so it's not just this bungalow. One minor thing- I emailed the property manager on our second day there that the hair dryer was broken and did not work when I turned it on, and it was not replaced so I had to wind-dry my hair the entire time or wear a hat. Oh, well, nobody knew me, and maybe the people who stayed there before us never told them. I did not want to leave this lovely spot! Great suggestions! Thanks for taking the time to leave a review! Beautiful. Loved waking up to sunrises and walking the deserted beaches. Bungalow was perfect size. Stars at night were amazing! Thank you for your review. So glad you enjoyed the Bungalow. A wonderful escape with privacy, great snorkeling, and everything you need! Property is just right for us. It’s our second time there and we love the size, the location and how it is our ‘escape’ yet also convenient to everything being in N Palmetto Point. It has everything (and more) to spend a wonderful vacation! Wonderful, beautiful piece of earth. Loved our time at Island Breeze. You know where to find us for your next vacation! Glad you enjoyed your stay! Rates are subject to change until reservation is confirmed. Signed Rental Agreement, provided by the owner, required.